One of my favorite items growing up was the "Vada Pav". 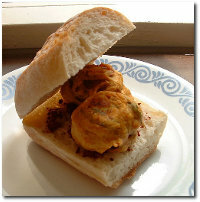 Vada Pav, sometimes spelled wada pav, is a popular vegetarian fast food dish native to the Indian state of Maharashtra. It consists of a batata vada (potato fritter) sandwiched between two slices of a pav (bread). Batata is potato in Marathi and Pav refers to bread (or bun). Finely cut green chilies and ginger and a phodani (tempering) of mustard seeds and turmeric are added to a mash of boiled potatoes, and after dipping patties of the mash in an herb-seasoned batter of gram flour, the patties are deep-fried. Vada pav is typically served with a chutney (sauce) which is commonly made out of shredded coconut Ãƒ¢Ã¢â€š¬Ã…meatÃƒ¢Ã¢â€š¬Ã‚, tamarind pulp, and garlic. Vada Pav is typically sold on the street corners of Mumbai. 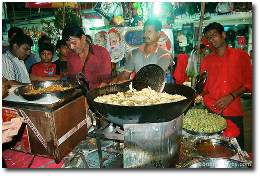 Each vada pava vendor typically has a small cart with a large frying wok to make the vadas. The carts are similar to the hot-dog carts seen in New York. The Pav is typically sourced from local bakeries. Some of the vendors have bigger shops as well. The buyers normally eat their vada pavs near the cart (see image alongside). You typically find a lemonade or sugarcane juice stand near by. Vada pav was supposedly devised by snack vendor Ashok Vaidya outside Dadar station in 1971. Vada pav served in the nearby state of Gujarat is usually fried in Butter or edible Oil. The Pav is first fried in a mixture of Butter or Oil and dried red chilly powder. After that the chutney is applied in the hot fried Pav and the Vada is placed in between. This is the only difference between Vada pav in Gujarat and Maharashtra. In the state of Gujarat, the original unfried Vada Pav recipe is referred to as "Bombay Vada Pav". There are thousands of Vada Pav stalls all over the city and everyone will tell you that their local Vada Pav stall is the best in the city. If you ever hit Mumbai, make sure you get one. I see a McVadaPao on the McDonald's menu in the near future. In the meantime, you can try and see if you can get Vada Pav at some of your local Indian restaurants.